The lace on this collar is so pretty. I wish who ever made the collar utilized it in a nicer style. 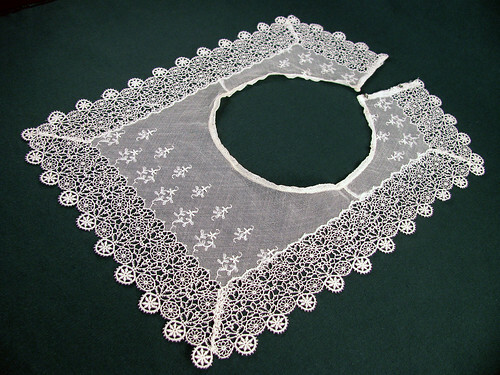 It looks very much like a lace bib when worn. The neck opening is large, about 19″, so it may have been a collar for an older woman. I do like the way it is made. 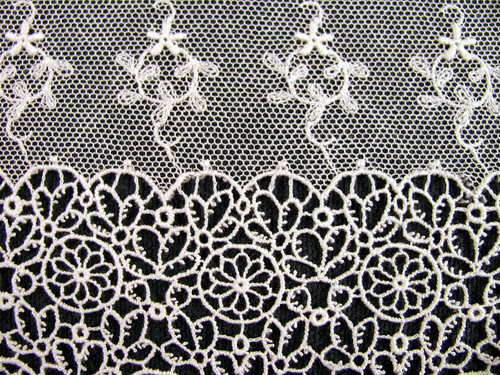 The side edges are the border of the lace mitered to go up each side. I may try that on a border print, so the print goes up, say, the side seams of a blouse or sleeve. It would work on a curtain too. One reason I am sharing these pieces is for inspiration. There is at least one idea in each piece that can be adapted to a new project. Just a note: The collar could have been worn with the opening in the front. The placement of the shoulder seam suggests that. I just would think the nicer corners would be in the front. I wonder if things I make now will be as confusing to others in the future as these bits of lace from the past are to me now. This close up shows how the lace edging was embroidered onto the net. 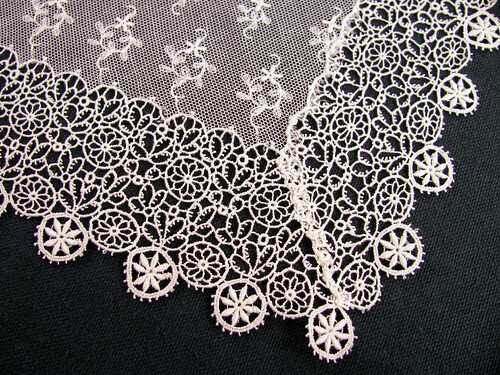 I wish I had a couple yards of this lace to make a something frilly with. By mitering the corners the outside edge of the collar stays in pattern. This entry was posted on Saturday, March 21st, 2009 at 3:00 am and is filed under Lace and Vintage. Tagged: Clothing, Fabric, Lace, Needlework, Sewing, Vintage. You can feed this entry. You can leave a response, or trackback from your own site. Very pretty…I had not thought about how it would be work but it makes sense that the opening would be in the front!